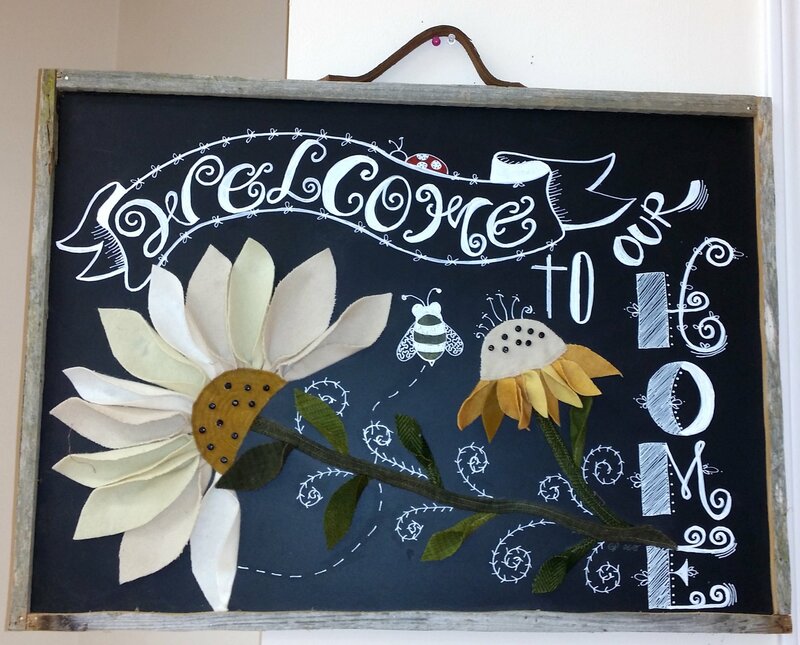 This is the first of our "mixed media" technique classes working with both wool and chalkboard lettering. You DO NOT have to be an artist to complete your lettering and drawing - let Gloria show you how! You will also be given templates for your wool shapes. Then we'll join them together with a simple straight stitch on our sewing machine and glue them to the chalkboard (frame NOT included). We'll drill holes at the top of your chalkboard and supply you with tape measure ribbon for hanging. Approximate Size: 20" x 28"
Kit Contents: $20 - Pay instructor on first night of class. Includes Pattern, two chalk pens, chalk, transfer paper, pre-painted chalkboard, wool, hanging ribbon, tiny black buttons (19).